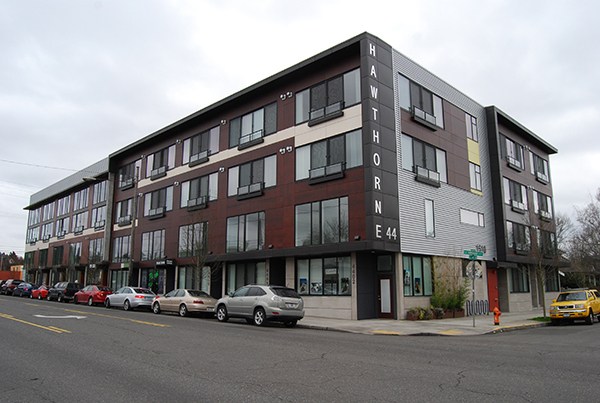 Hawthorne 44 is a 27-unit apartment property located in Southeast Portland, Oregon. These unique apartments offer condo-quality construction with over-sized units and high-end finishes in the desirable and close-in Hawthorne District. Unit amenities include gas fireplaces, cherry hardwood floors, granite countertops, oversized walk-in closets and in-unit washers and dryers. Hawthorne 44's price per unit was at the extreme high end of the range in the market. The price point with this number of units ruled out most institutional buyers. HFO's in-depth knowledge of the market and nuances of the close-in Southeast market allowed us to source a private equity buyer from Eugene. This was their first multifamily purchase in the Portland market. HFO's ability to source both institutional and private capital helped bring an excellent price for the seller -- a 5.5% cap rate and a price-per-unit of $203,704. The seller was a San Diego investment fund and the buyer was The Willamette Company of Eugene. HFO represented the parties in the $5.5 million all-cash sale.